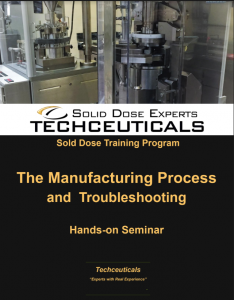 The Manufacturing Process is a comprehensive solid dose training course that has been in the making since 1977. 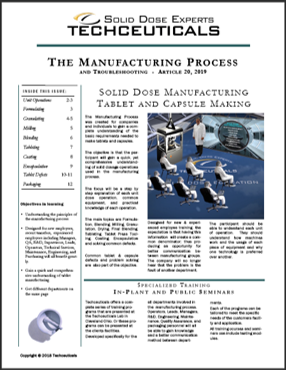 Loaded with practical information on how tablets and capsules are made, it is designed for experts and novices alike, putting the entire manufacturing team on the same page. The participant will be able to identify machinery, why it is used, and what it does. In other words, the participant will be able to go into any facility and understand the equipment and process at a glance. This training event is a hands-on, step by step program, covering why and how we manipulate powders to improve them for tablet and capsule production. We define each unit operation: weighing, milling, granulating, encapsulation. This is a team building course, one that can be delivered to small hands-on groups, or for the entire manufacturing team. We find that many companies send out scouts to participant in the hands-on session and then often request we deliver this course at their facility. Managers, Supervisors, Operators, Tech Services, R&D, Formulators, QA/QC, and Maintenance. This course is designed to provide powerful tools that the participant can put to work immediately. If you are involved in the tablet or capsule manufacturing environment this course is for you. The Manufacturing Process is a two and a half day comprehensive course covering the essentials needed to make quality tablets and capsules. The Manufacturing Process is exactly what our industry is about today; delivering the methodology, documentation, and mindset required to meet the needs of our changing industry. We will focus on a step by step explanation of each unit operation within the manufacturing process, common terminology, and practical knowledge of each topic. Hands-on breakout sessions will be part of this course!